Nevermind that I got to screen a Friday the 13th fan film on Friday the 13th at a horror film festival in the mountains of Colorado. Forget how cool that circumstance alone is. When fans get a film right, they get it RIGHT. Never Hike Alone is the best fan film I have ever seen. Hell, so far, it’s the best fan film I have ever heard of. In every frame of the movie, you can tell it was made by fans, by people who both know and deeply love the franchise. That shows, and that works. 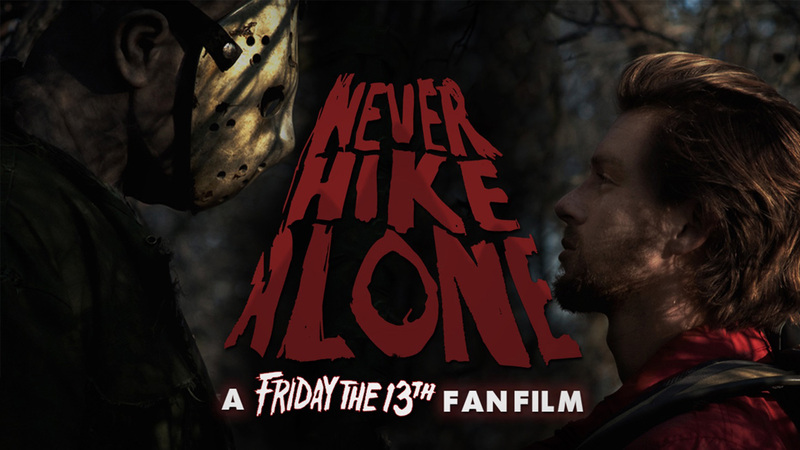 Never Hike Alone strips Friday the 13th and Jason Voorhees back to basics. Before Manhattan and outer space and little tiffs with other famed slashers. They make Jason simple and elemental again, and somehow, that has always been his most terrifying. Poor Kyle sets off hiking in the woods alone, documenting his hike and promoting his tools for his followers. Yet, in his misadventure, he stumbles onto an abandoned camp. I think you can guess which camp that is and which sole resident does not take kindly to his trespassing. And that’s it. Kyle running from Jason through the ruins of Camp Crystal Lake. It’s basic, and it’s simple, and it WORKS. Sometimes, the easiest answer is the answer, and I think the answer in Never Hike Alone is just what the franchise needed (unofficially) to get back to its roots. The film never feels low-budget or like a kickstarter. Nor does it seem unauthentic or like a knock off. Instead, it feels like the next step the franchise should be taking (officially).